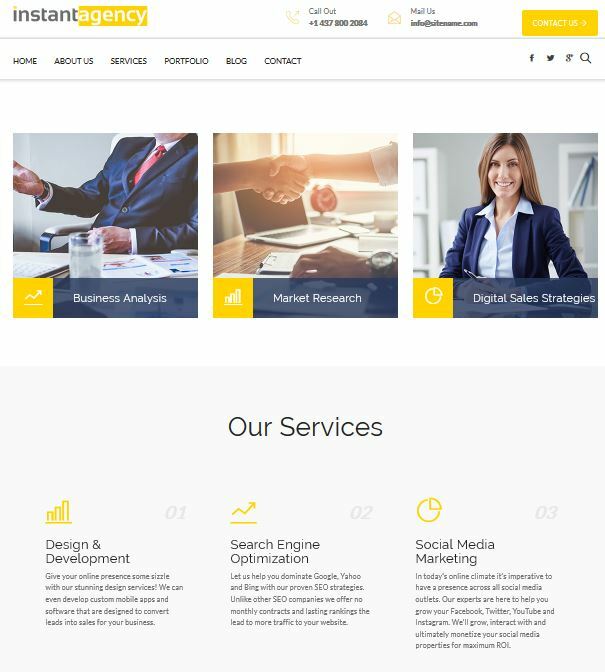 "Killer New WP Agency Theme gives Your Business a Stunning, Professional Presence in just a few clicks!" ...plus it comes full with developer rights! "This STUNNING Theme was Designed to Convert Leads into Clients like Clockwork..."
So many agency sites these days fail to help you stand out and most importantly convert visitors to your site into prospects calling/emailing you looking to buy. 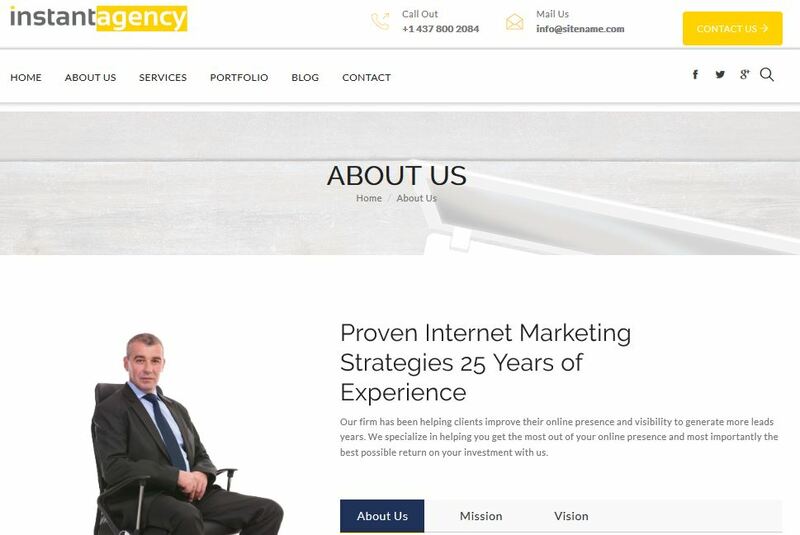 We designed the Instant Agency Theme with the goal of giving you a professional presence in minutes but most importantly making sure that site will convert visitors into prospects. Every section and page on your new website has multiple calls to action along with contact forms, social media and your phone number that remains at the top of every page! The best part is you can even integrate with an autoresponder (free with mailchimp) and follow up with your leads on complete autopilot! 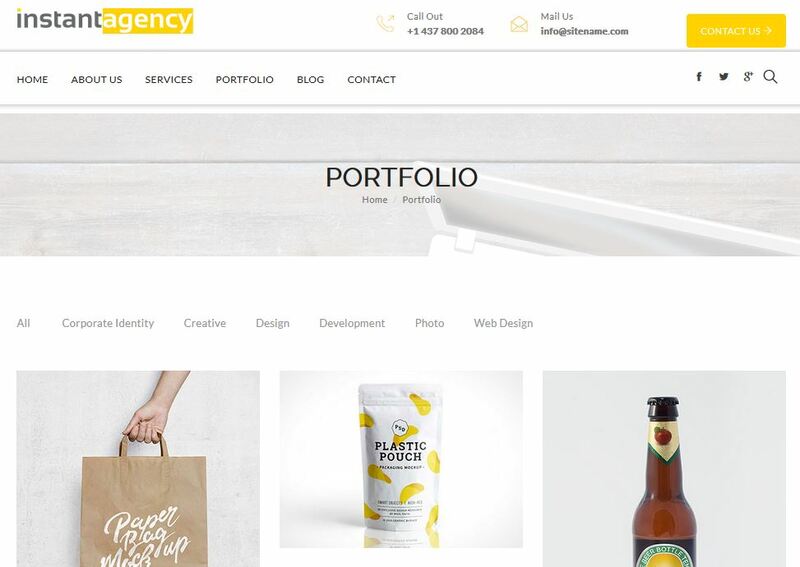 The Instant Agency Theme was designed to look amazing right out of the box to save you time. In fact you can have an exact replica of the demo you'll see on this page up and running in just a few clicks! Not only that but it's mobile responsive, comes with built in animations and it's super easy to customize any part of your site using our custom WP Dashboard. 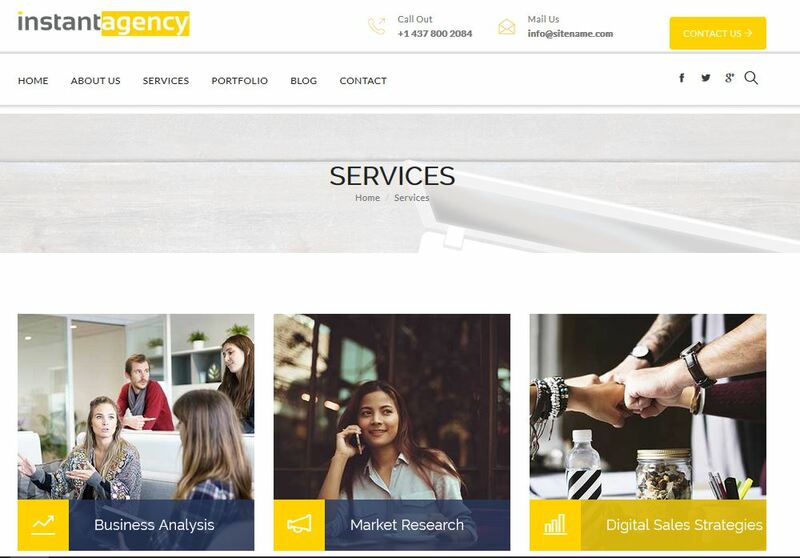 It also comes with all the key features an agency needs including a stunning home page, services section with pricing tables, super slick portfolio section and even professionally written pre-loaded content! 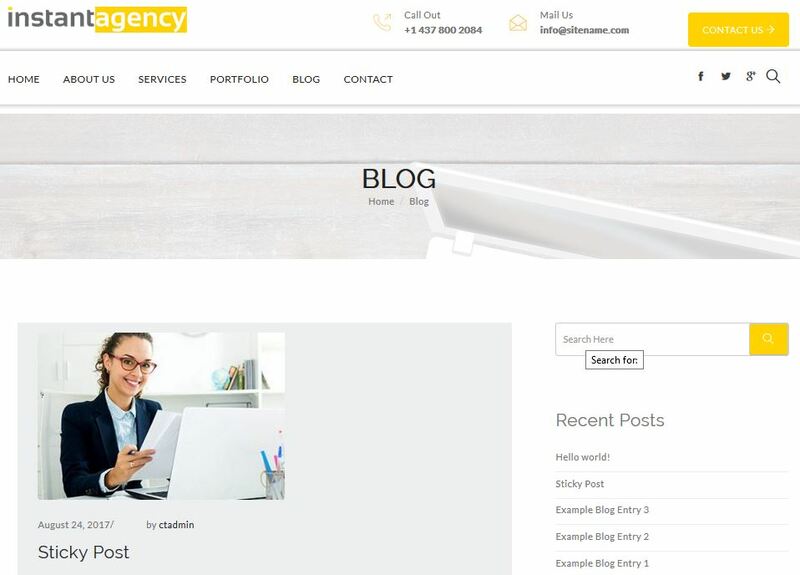 This theme will give your business a professional agency look right in just minutes and since it comes with developer rights you can use it on as many sites as you like! When you first start out as a local marketer with no clients or credibility it can be tough to get prospects to trust and buy from you. The best thing you can do is get a good logo created, business cards, find a way to get some portfolio projects and then build an agency site you can use to show prospects your skills! The problem however is how easy it can be to spend hours upon hours trying to build the perfect site when what you should be doing is focusing in landing more clients. Even worse it can get really expensive buying all kinds of plugins, paying designers or even just getting developer rights to a good theme that still takes hours to customize. That's a lot of money to pay just to be able to use a theme you bought on more than one site! Even the regular license for many of these themes are still pretty high priced and they don't even deliver a full solution! Then have to either write the content or pay somebody to do it, purchase stock images, pay for videos to be made and the list of expenses keeps climbing before you've ever landed a client! 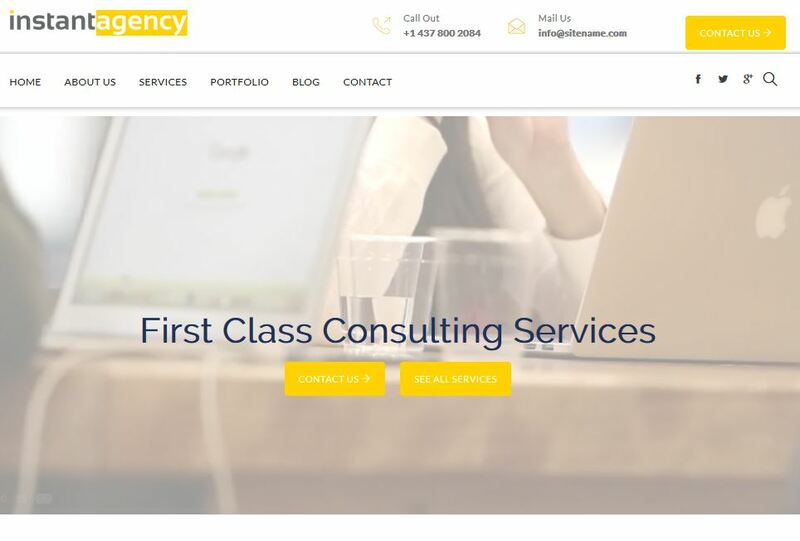 We think that's just plain crap and there is an easier way for you to get that big brand agency look without all the hassle that comes with the standard WP theme. That's why we created a Solution that Gives You a Professional Agency Website in Just a Few Clicks! .. for a FRACTION of what it would normally cost you! We get it, we really do. All of us started our client businesses from scratch with nothing more than some ambition and basic knowldedge just like you. I started from my grandmothers kitchen table with basically no money, connections or anything to give me a leg up. Robert started his from his parents basement with virtually no sales skills or business experience . 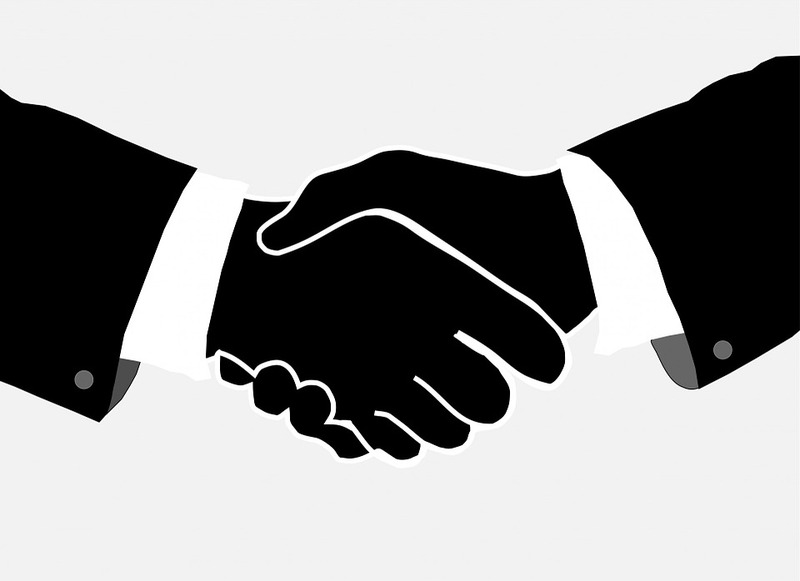 Between us we have over 25 years of experience and have serviced hundred of clients in a wide variety of local niches to date. We fully understand how difficult it can be to get your business off the ground and the many struggles that come with that. At first with no porfolio or credibility it can be really hard to get clients to listen to you. Essentially you have to drum up business any way you can often chasing clients, begging them to trust you and in the end working for way less than you should be. Many local marketers fail before they even start by getting overwhelmed with all the "stuff" like business cards, website, services to sell, pricing to charge and the list goes on. They key to really getting going is finding a solution for these things that does the things you need without wasting all the time or money so you can focus on landing clients. Over the years we've trained thousands of local marketers just like you on how to build their agency fast while growing on the fly and most importantly keeping a steady stream of business coming in. Because we hated seeing so many people struggle with the little stuff we decided to create a solution that would bypass all the headaches of creating a killer agency website and make it drop dead simple. 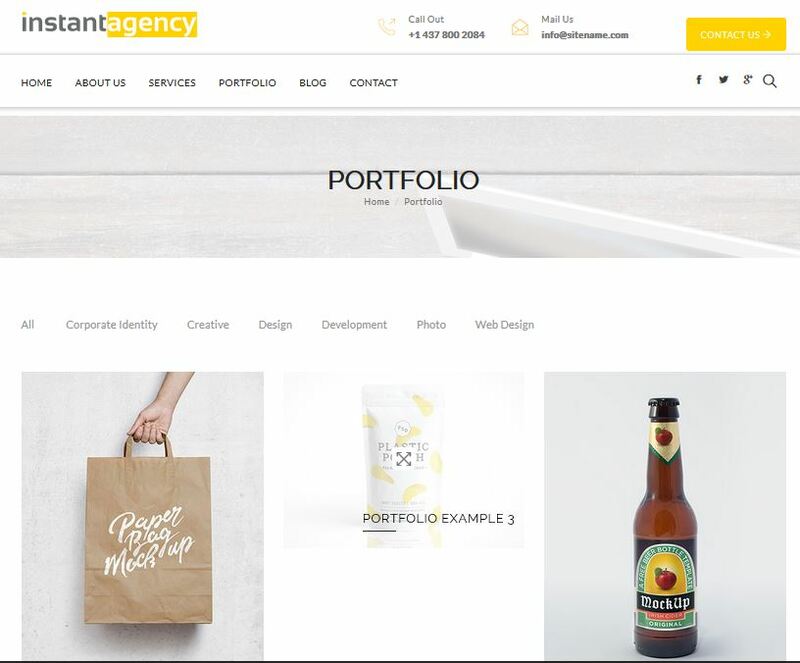 The Instant Agency theme is the ultimate marketing agency WordPress theme that comes ready to rock right out of the box with one click install! Our beautiful high converting design will give you that 'big agency look' in just a few minutes and is super simple to customize. Plus right now we are offering complete developer rights meaning you can use this theme on as many sites as you like! "Designed to Give You An INSTANT Presence That's Easy to Customize In Just Minutes! 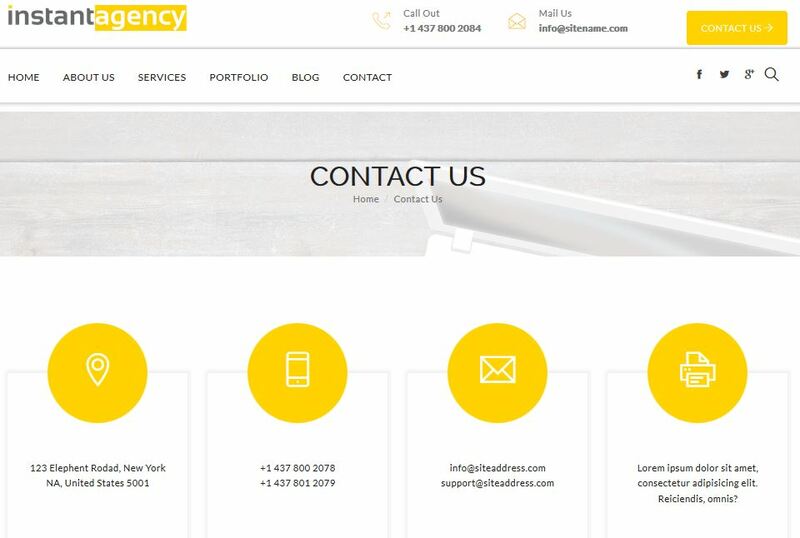 Check out just a few of the features pre-loaded for Agencies..."
The #1 goal of your agency website is to convert visitors into prospects by getting them to 'raise their hand' and send you their contact information. 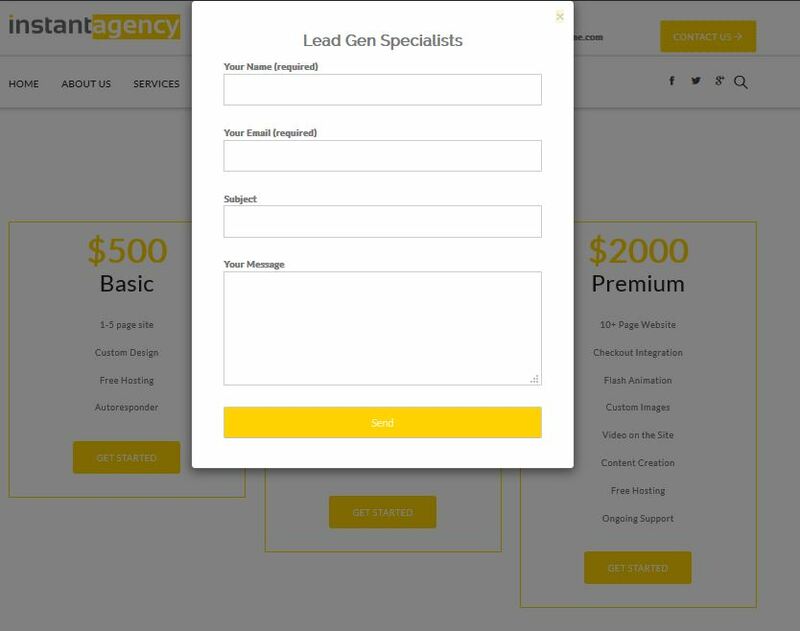 The Instant Agency theme has multiple points for your prospects to optin including built in pop up lead forms! 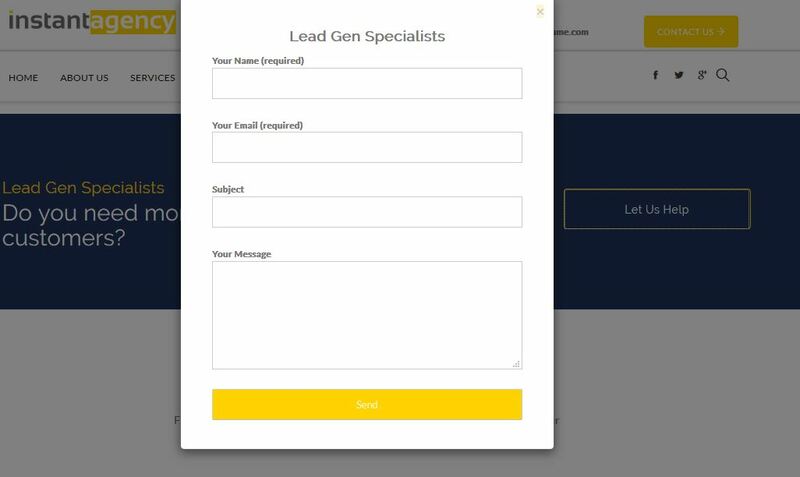 You can create multiple lead gen forms, control the destination links and more! It would take a designer hours to create such an in depth and beautiful home page like you get with our theme! Plus you can easily edit or simply remove any section you don't need! We designed this home page to give you that big brand look even if you're just a small agency still getting started. What's great is with our one click install you can have this exact home page with your branding in just minutes! 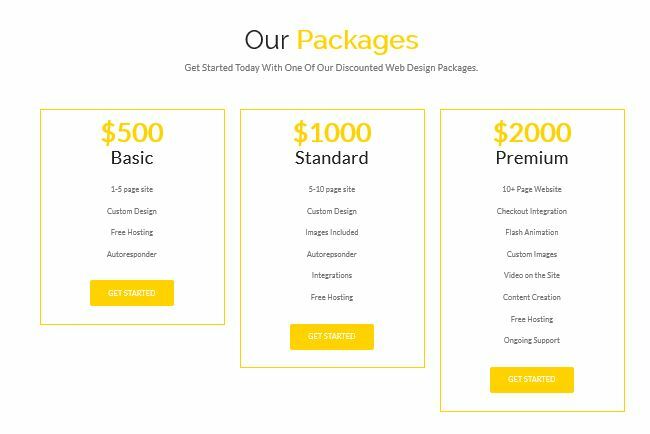 It's no secret that one of the best ways to convert clients is the use of packages designed to drive them to your most profitable "package". 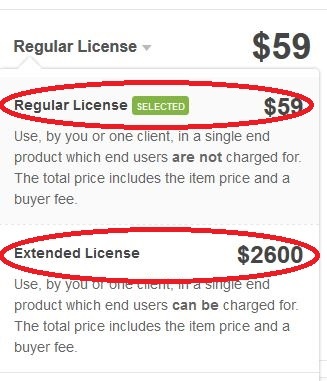 Normally you would need an additional plugin (costing you more money) to create pricing tables like this one but with our theme you get that functionality right out of the box! Plus with our easy to use dashboard it's super simple to change the content of the pricing packages to match your services! The portfolio section is one of the most viewed sections on any agency website so we created a beautiful section for you to display your past work to clients. With super slick animation your designs, videos or case studies will shine when clients check them out, giving you a leg up on competitors with weak portfolios and poorly designed sites. One of the most time consuming parts of setting up your agency site is writing the actual content that goes in it. We've taken care of that for you with pre-loaded content from a world class copywriter! 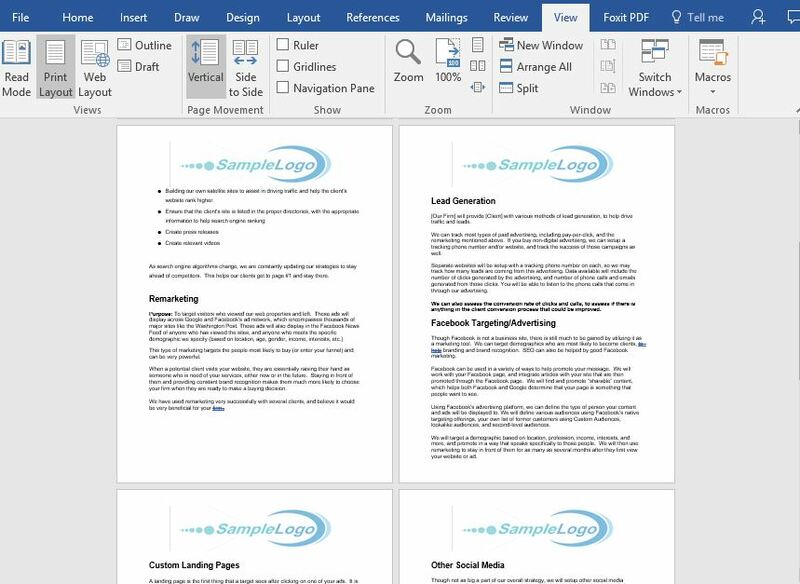 You are free to use/edit the content as you see fit and of course if you don't want to use the pre-written copy you can always add your own content to match your business. You also get four different layout options to choose from including boxed or full with and video or image sliders. The best part is you can install any layout with just one click! It's also super easy to add your logo and simply update the color scheme to match your companies look and feel! "Not only that but Instant Agency also comes with a One-Click-Install and is Super Easy to Customize in just Minutes..."
Because we want you to be successful and we realize that having a killer agency website is only half the battle when it comes to running a marketing business we decided to add some bonuses to help you out. 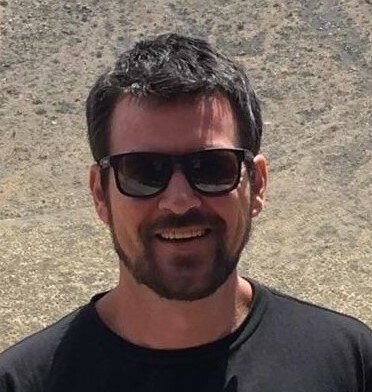 Not only are we going to show you several of our best methods for getting clients coming to you ready to buy high ticket services but we are also going to show you how to drive traffic to your new site for pennies on the dollar! During this live webinar training you'll learn a proven strategy for landing clients on near autopilot without doing any "selling". This system gets prospects coming to you ready to buy high ticket recurring services in a way that you've never seen before! In fact this system was generating $10k/mo in recurring revenue within weeks of implementation! Plus it works for any service you sell including Video, SEO, Facebook marketing and more. For those of you who don't mind getting out there and talking to people, we also share some of our best networking strategies in this never before released training. This course is worth the price of our Instant Agency theme alone and theme some! To help you sell your internet market services we created a super cool explainer video that you are free to use as you choose! The best part is this video works perfectly on the home page of our theme where there is a spot already in place for a video to help you convert leads even better! To give you as much ammunition as possible to promote your business both online and offline we added an entire lead gen flyer kit that you can customize and use as you like! Normally just getting one good flyer would cost you more than this whole package but today you get 10 of them for free when you pick up the instant agency theme! Least but not least you also get 10 premium video ads for local businesses that you can sell or giveaway as you like! These 15 second teaser videos have a sharp design and flow that catches the users eye and gets them clicking over to your clients offers and websites. These videos are the perfect 'foot in the door' offer to get local clients interested! "All of These Bonuses are Included for FREE when You Pick up the Instant Agency theme Today..."
By Combining the Instant Agency Theme with Our Exclusive Bonus Package you'll have everything you need to hit the ground running and starting landing clients quickly! You'll have an instant professional presence in just a few clicks that you can easily customize in minutes to match the look and feel of your business for a fraction of what it would take to build yourself. Plus you get live training that shows you an autopilot system for landing high ticket recurring clients for any service! You also get our private lead gen training teaches you multiple methods for growing your client base rapidly. Then you get additional lead gen materials to help you promote your business and even 10 videos that you can sell or giveaway to local businesses! Plus we even show you how to use those videos to drive traffic to your new agency website! Do I get Developer Rights? Yes! The Instant Agency theme comes with Full Developer rights meaning you can use the site on as many domains as you choose. You can even use it to create websites that you sell to clients! The only thing you cannot do is sell the theme itself to a 3rd party. Feel free to use it over and over on your own sites though! Yes absoutely! We have a world class support team here to help with any questions you may have. In addition we have a private members area with in depth training on how to use the theme (it's really easy though) so you should have no issues getting setup. If you do need anything however we are always here to help!